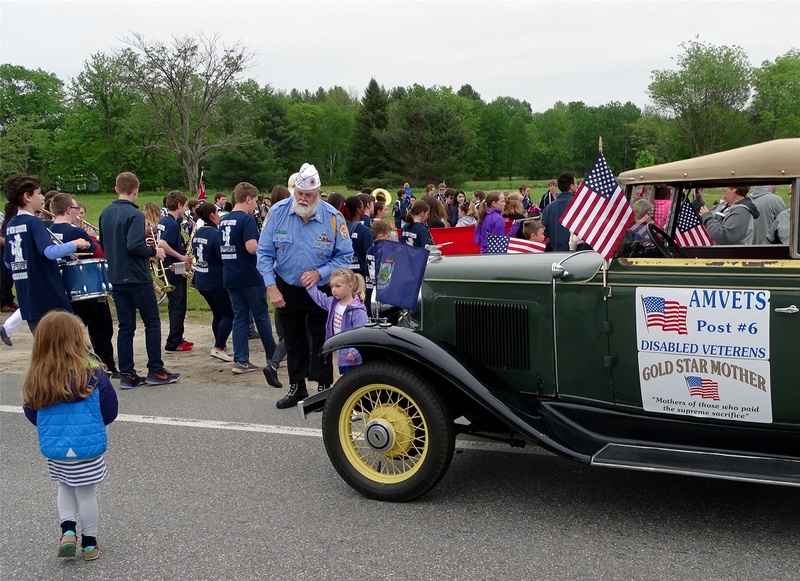 Undaunted by gray skies and cool weather, hundreds Monday lined the Memorial Day parade route from Memorial School to the Veterans Monument at Route 100 for a solemn ceremony of remembrance. The parade brought Boy Scouts, politicians, political parties and political candidates together with a cheerleading group, pets, a tractor, a horse and rider and an electric bicycle. Willy Danforth (center with white cap) serves as the parade organizer for the second consecutive year. Michael Fralich, co-founder of Healing Through Horses, is preparing to ride his horse Cyra in the parade. 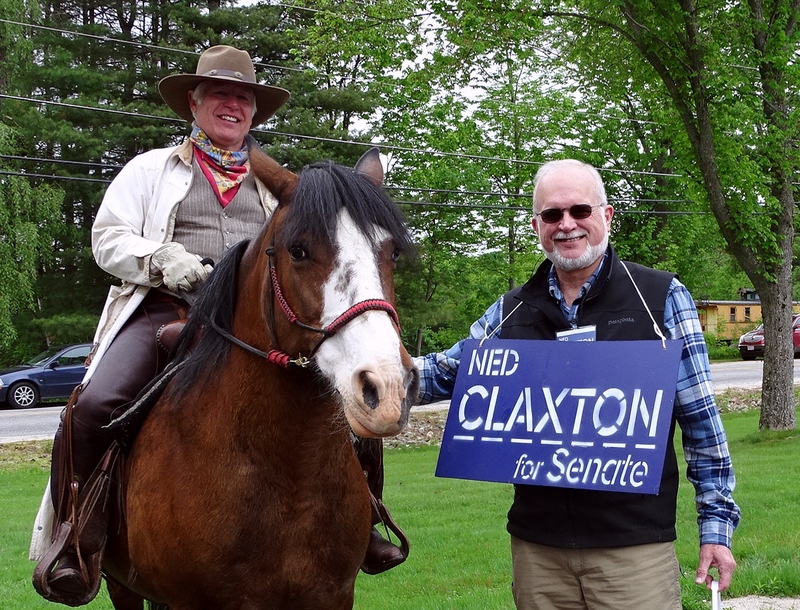 He chats with Ned Claxton, candidate for State Senate District 20, before the parade steps off. 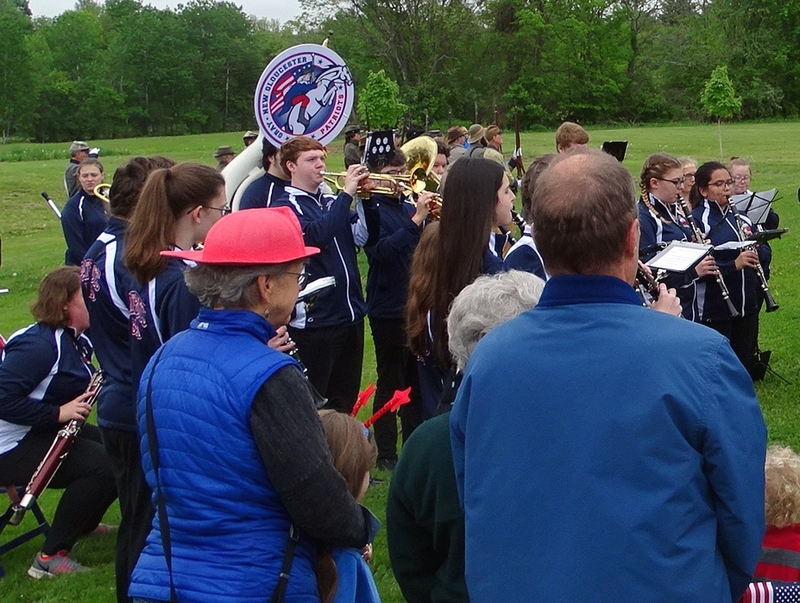 The Gray-New Gloucester High School band performs a tribute to the branches of the U.S. military at memorial services held at the New Gloucester Veterans Monument. 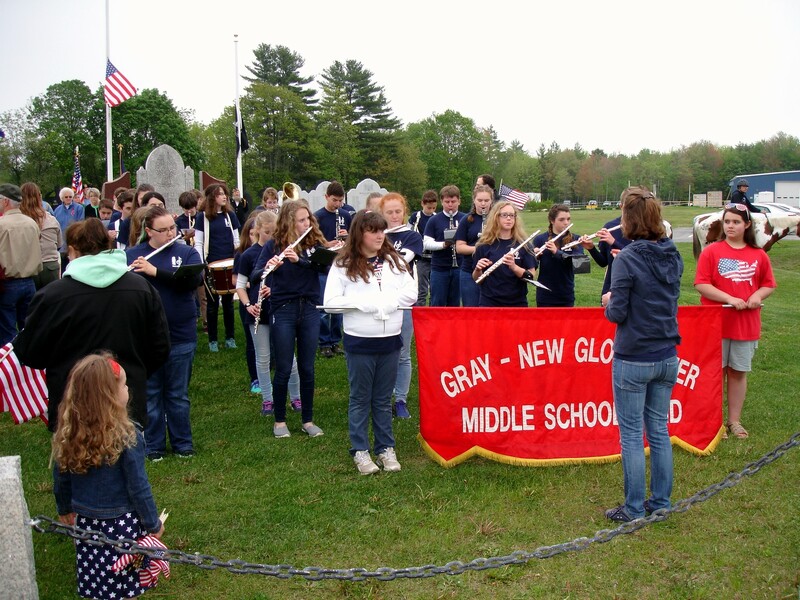 The Gray-New Gloucester Middle School Band plays a patriotic song at New Gloucester Veterans Monument Park during memorial services in conjunction with the 2017 Memorial Day Parade. The start location for New Gloucester’s annual Memorial Day Parade is the Memorial School at 86 Intervale Road. The parade route proceeds northerly along Route 231 and then heads to the right at the blinker light onto Route 100. The procession stops at the New Gloucester Veterans Monument Park for memorial services with brief remarks by several dignitaries. Afterward, the parade route goes right onto Peacock Hill Road, then left onto Gilmore Road. The route ends at the post office where participants cut across to the Amvets Hall, 1095 Lewiston Road, where they are invited to have refreshments. Parade participants are to arrive at the start location to begin lining up at 8 a.m., Monday, May 28, for a step-off time of 9 a.m. In case of inclement weather, the memorial service will occur inside the Amvets Hall. For more information or to sign up your organization to participate in the parade, call Willy Danforth at 777-4759. Cumberland County 4-H members Caleb and Katie McGrath-Holmquist and Amber, Amanda and Austin Holmes are raising money to buy three market hogs and three market lambs from the Cumberland Fair 4-H Livestock Auction on Wednesday Sept. 27, at the Cumberland Fairgrounds. The livestock will be donated to the Gray and New Gloucester Food Pantries. The two families are longtime members of the Cumberland County 4-H Sheep Club and the 4-H Swiners Club who raise market lambs and hogs to be sold annually at the fair’s 4-H auction. This year, in addition to raising and auctioning their own animals, they are participating in a self-designed community service project to benefit both 4-H’ers and their local food pantries. 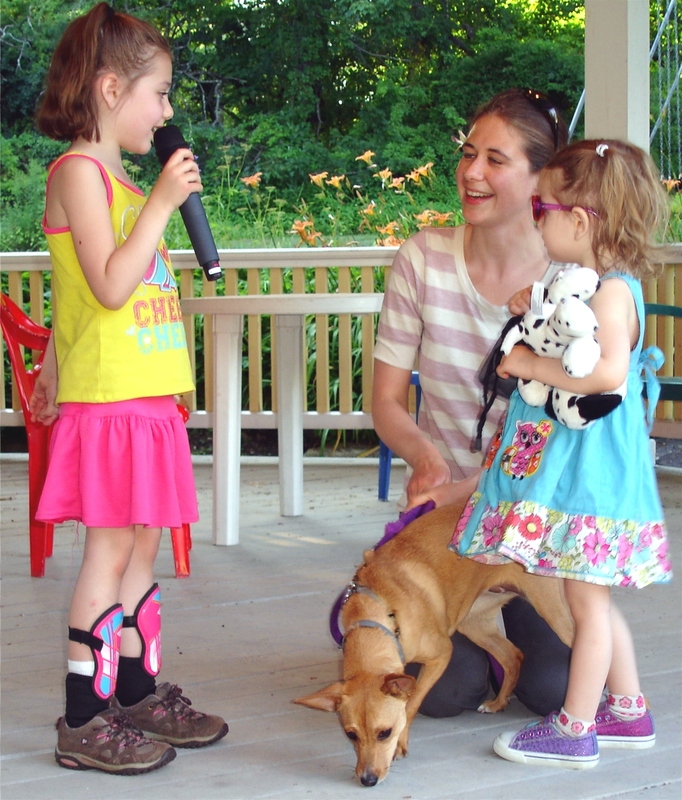 They hope to raise $3,600 to buy the animals. They will be selling donated water, soda and lemonade at the Gray Blueberry Festival on Saturday Aug. 12, from 9:30 a.m. to 3:00 p.m. at the Pennell Municipal Complex, 24 Main St., Gray. Donations of any amount can be sent to GNG 4-H Food Pantry Project, P.O. Box 1012, Gray, Maine 04039. Checks can be made payable to: GNG 4-H Food Pantry Project. The route for New Gloucester’s annual Memorial Day parade has changed due to road construction. The parade route will begin at the Amvets Post #6 Hall, Lewiston Road, Route 100. The procession will stop at the New Gloucester Veterans Monument Park for memorial services with a wreath-laying and brief remarks by several dignitaries. Afterward, the parade resumes by proceeding left onto Peacock Hill Road, left onto Gilmore Road to proceed past the post office, then left onto Route 100 to proceed back to the Amvets Hall. How does one begin to describe Dennis Brackley? Papa, Daddyo, Ole Hoss, Big Brother Denny, Homa, Catfish, Uncle Jesse, Coach and Santa are just a few of the names he answered to. 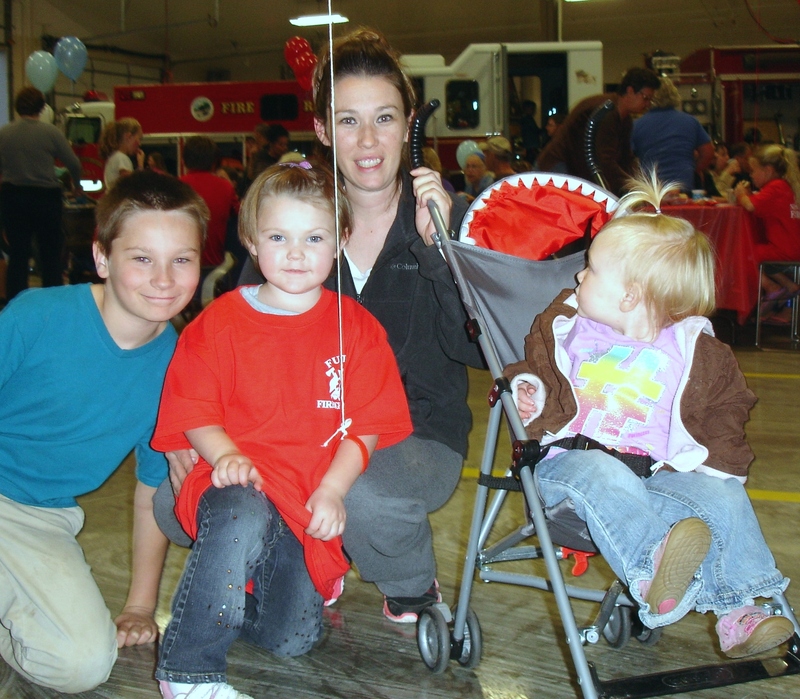 New Gloucester residents Devon Nuzzo, 10, left, Rylee Farwell, 3, Amy Farwell and Mya Farwell, 1, enjoy their visit to the New Gloucester Fire and Rescue Open House on Oct. 19. Hundreds of visitors were treated to a free barbecue, live fire demonstrations, games, free T-shirts for kids and face painting. Lunn-Hunnewell Amvets Post 6 Auxiliary in New Gloucester is hosting its annual Harvest Supper on Saturday, Nov. 5, from 5-6 p.m. at the Amvets Hall, Route 100, New Gloucester. The menu includes ham, potatoes, carrots, squash, turnip, cabbage, onions, rolls, coffee, tea and punch, as well as homemade apple crisp for dessert. The cost is $10 for adults, $5 for children 6-12, free for under 6. 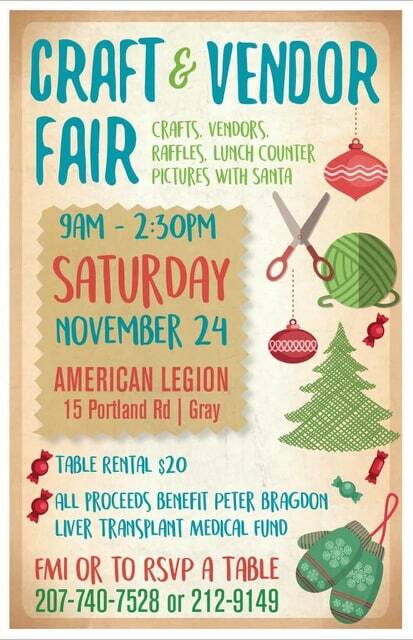 Proceeds are to be used to sponsor the auxiliary’s veteran’s hospital projects.